ION® ice augers took the world’s best auger and made it better. The re-designed ION X is built for extra holes and increased precision. The all-new 40V 5 amp-hour XC5 Battery increases charge capacity by over 60%, allowing ice anglers to cut up to 1600 inches of ice on a single charge. Whether drilling new holes or re-drilling old, frozen-over holes, ION X’s innovative cast bottom with centering point cuts more smoothly and accurately than ever before. At only 22 lbs., the ION is incredibly lightweight and easy to manage for all ages. Bicycle-style handlebars put your hands in the optimal drilling position and take the work out of ice drilling. With Straight-Through™ blades you virtually eliminate “catching” at break through, saving you from jarring stops or yanks. A smooth break through means no jagged ice at the bottom of the hole which can fray line and cost you a big fish. 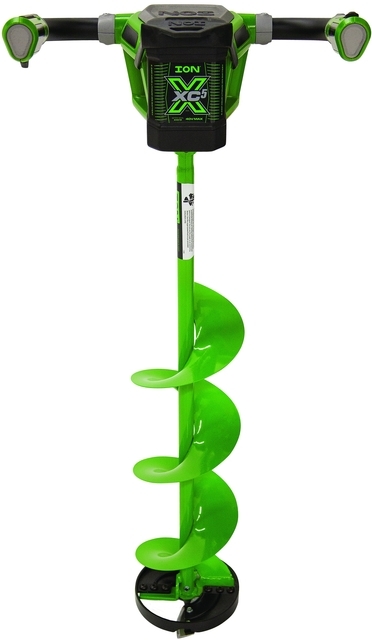 Every ION auger comes with an easy-to-connect 12-inch extension in the box, meaning you can extend the length of the durable, 34-inch long steel auger to 46 inches of drilling depth.